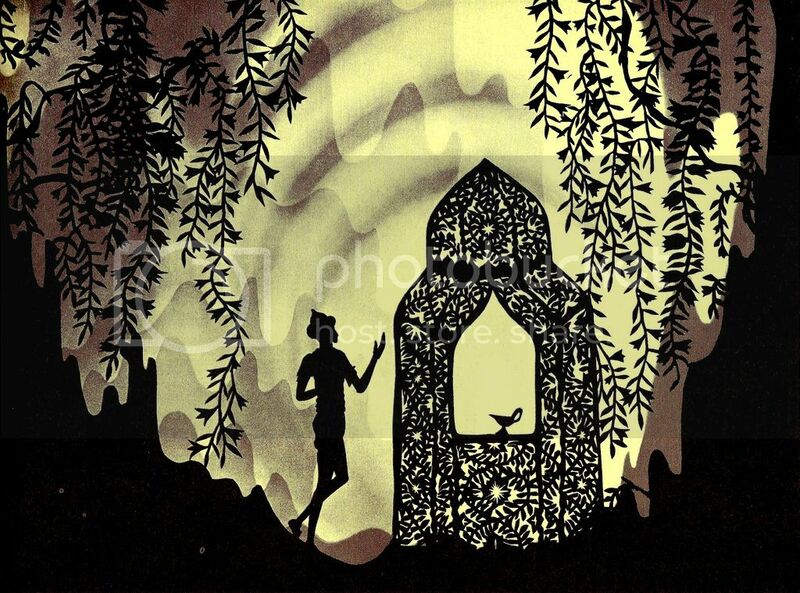 Any Disney book will tell you that Snow White was the first full length animated film, but Lotte Reiniger's The Adventures of Prince Achmed is "considered by many" to be the first full-length animated film. Snow White would undoubtably be the first full-length hand-drawn animated film, but Disney is not meticulous about making this distinction. 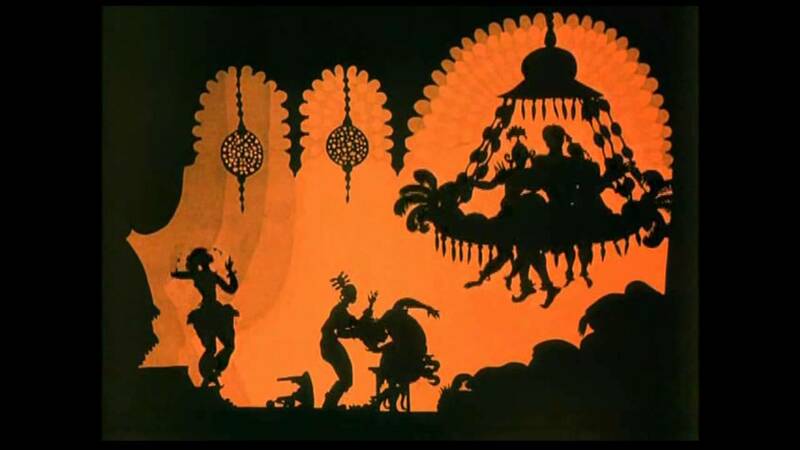 Reiniger's story is told through enchantingly intricate paper cutouts and premiered in Germany in 1926-beating Snow White by 11 years. This story is very sexually charged, but as everything is told through silhouettes, it's more subtle. 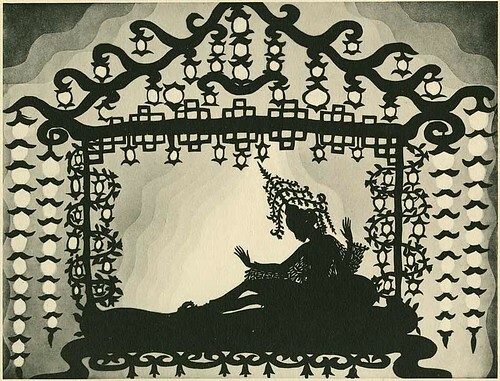 Prince Achmed is the hero, but I hardly think he's more noble than any of the horny villains. 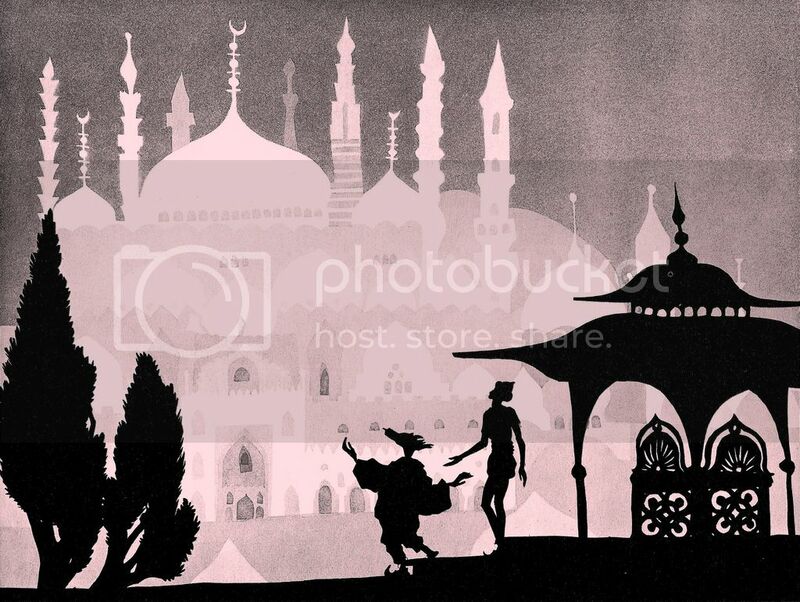 The story is based off of the story of "Prince Achmed and the Fairy" with a little Aladdin thrown in. 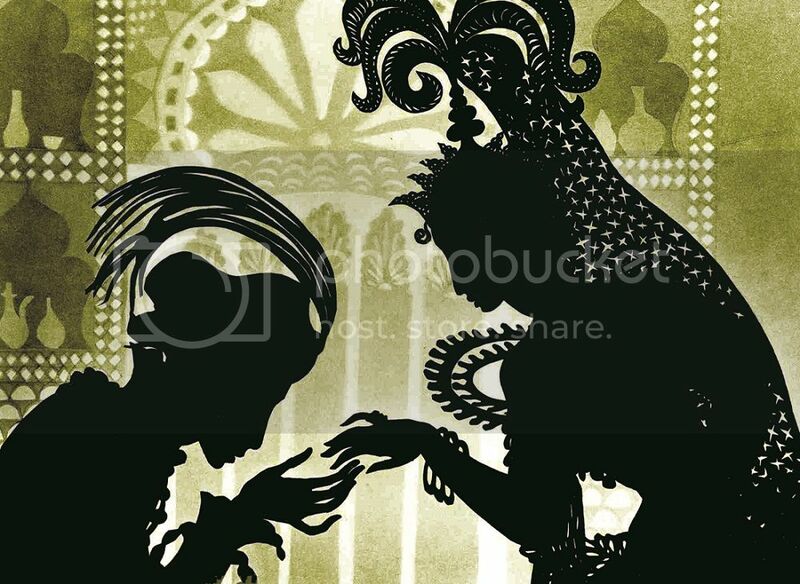 Lotte Reiniger has done versions of several fairy tales, including Cinderella, Hansel and Gretel, Thumbelina, and Jack and the Beanstalk. Portions, if not full versions, of all of these can be found on youtube. "You were born a street rat, you'll die a street rat, and only your fleas will mourn you!" 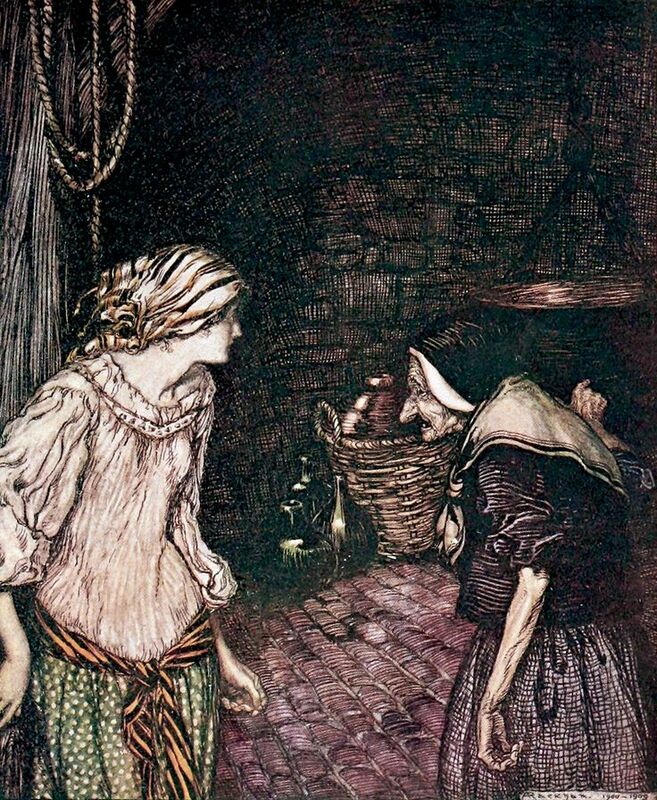 The Grimms' "Robber Bridegroom" isn't nearly as famous as Perrault's "Bluebeard," which is a shame because I think most people like it better. It's still every bit as creepy, as it features a woman who witnesses her betrothed and his friends killing and eating an innocent woman, but the heroine is clever and resourceful-she is able to find her way home because she throught to scatter lentils on the path to the house. Then she exposes the murderer safely by telling the story in public as if it were a dream, but then producing as proof a finger of the dead woman that had flown into her lap. The great Russian writer Alexander Pushkin wrote several poems based on fairy tales, including "Robber Bridegroom." This poem isn't nearly as exciting, in my opinion, as the Grimm tale. It tells the perspective of the bride's family and friends who don't know why she is so upset until the very end, when she reveals that she witnessed her new husband killing a girl cutting off her hand, and produces the hand with a ring on it as proof. Pushkin's tale also doesn't have the gory details of the Grimms, including the cannibalism of the victims. The poem can be read here. 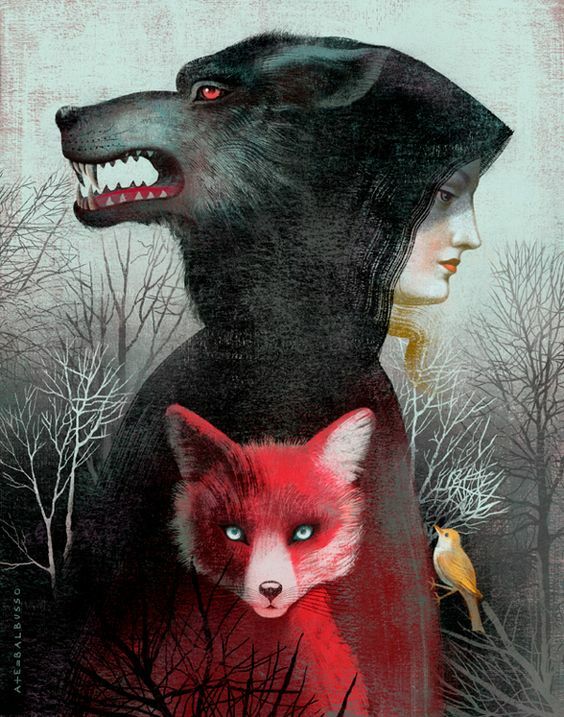 Mr. Fox is a very similar English tale. The heroine visits the house of the murderer, and first discovers buckets of blood and skeletons, then the men come home and she witnesses a killing. She exposes them in the same way as the bride in "Robber Bridegroom." 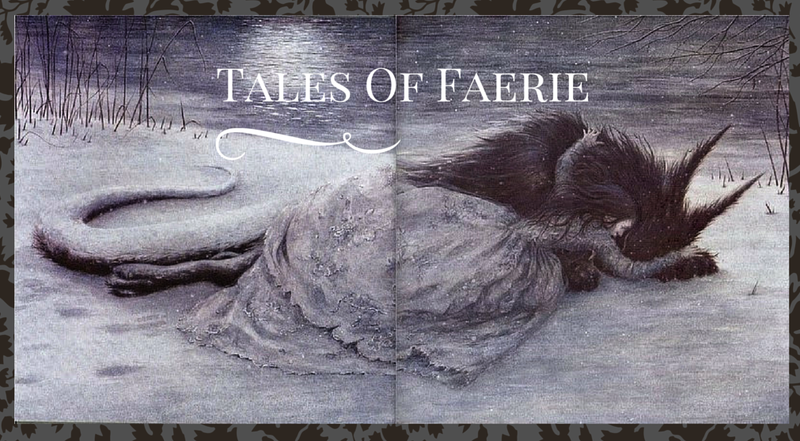 D. L. Ashliman has collected several fascinating variants of this morbid tale as well. 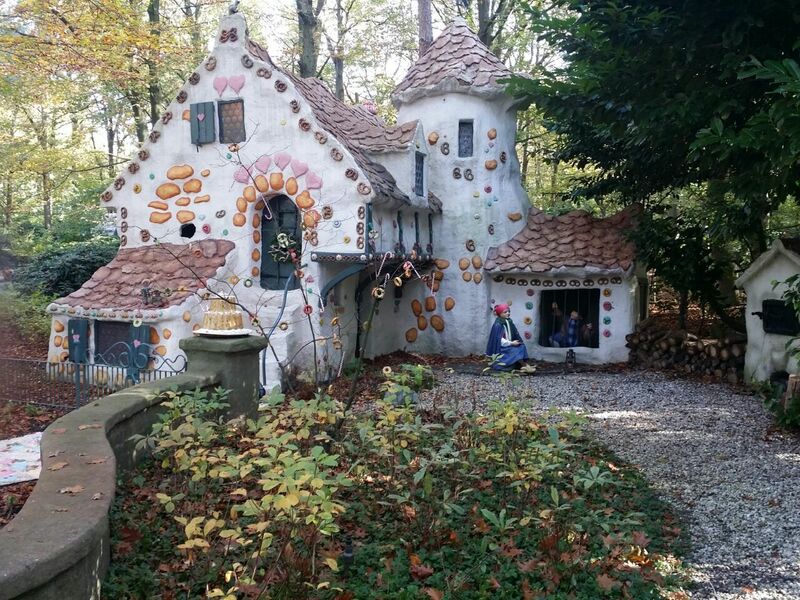 In a different German version (not the Grimms'), the bride is given the choice of being either boiled in water or oil, and on the witch housekeeper's advice, says she prefers water. This means she draws the water herself, giving her an opportunity to hide. 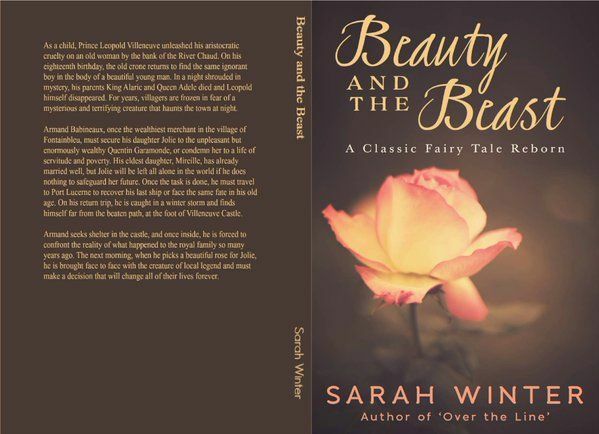 Although the cannibal slices off her toes in his attempt to find her, the blood magically disappears so as not to lead him to her hiding place in a tree, and a prince conveniently stops by the woods and saves her in the nick of time. 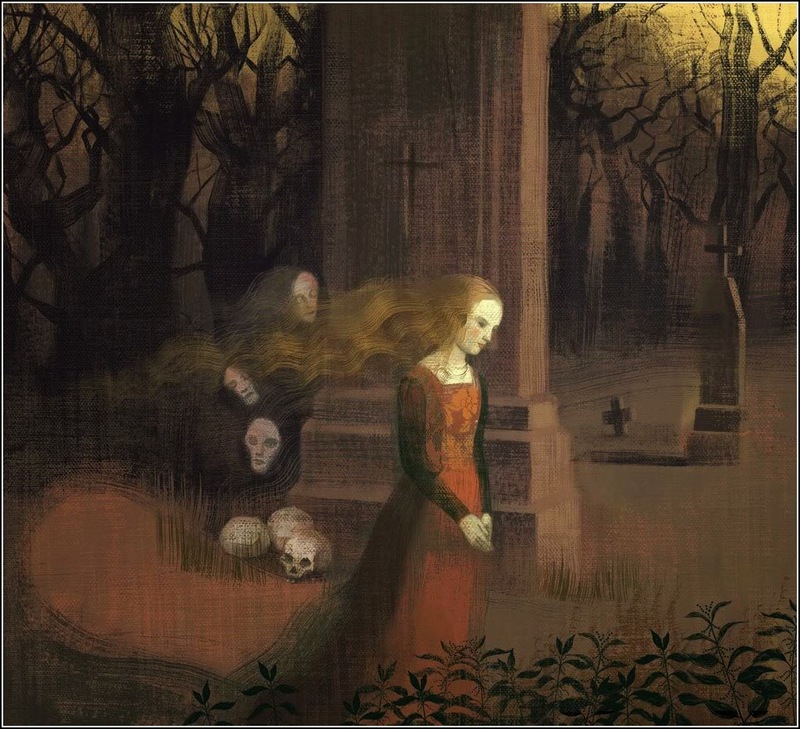 In some English versions, the girl comes across her sweetheart digging a grave and later hints at what she saw; sometimes the murderer is frightened off by her knowledge, but in a legend that supposedly took place at Oxford, he stabs her. 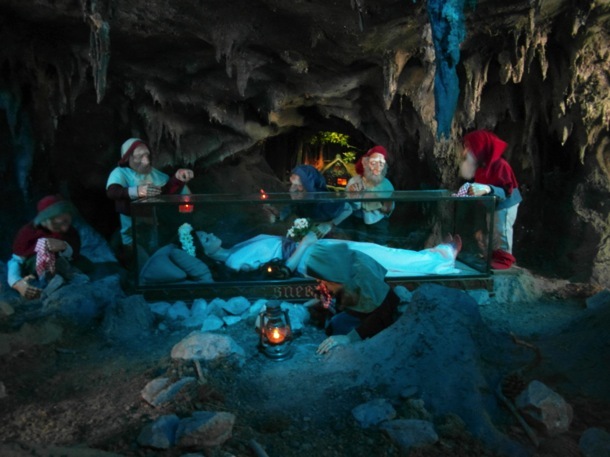 The "Robber Bridegroom" story is also told in the form of another English legend, Bloody Baker. In the Welsh Laula, the murderer succeeds in killing the first sister, but her elder sister had followed them and exposed the crime. The Cannibal Innkeeper is a very dark Romanian tale. 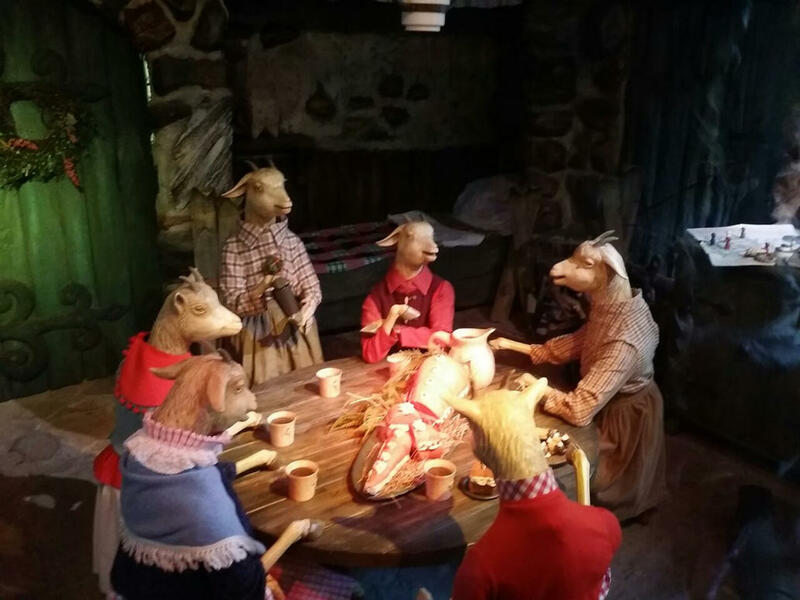 After a young servant girl refused to marry a man, he sold her to a cannibalistic innkeeper who locked her in a room and forced her to cook human flesh, which he then served to his guests. 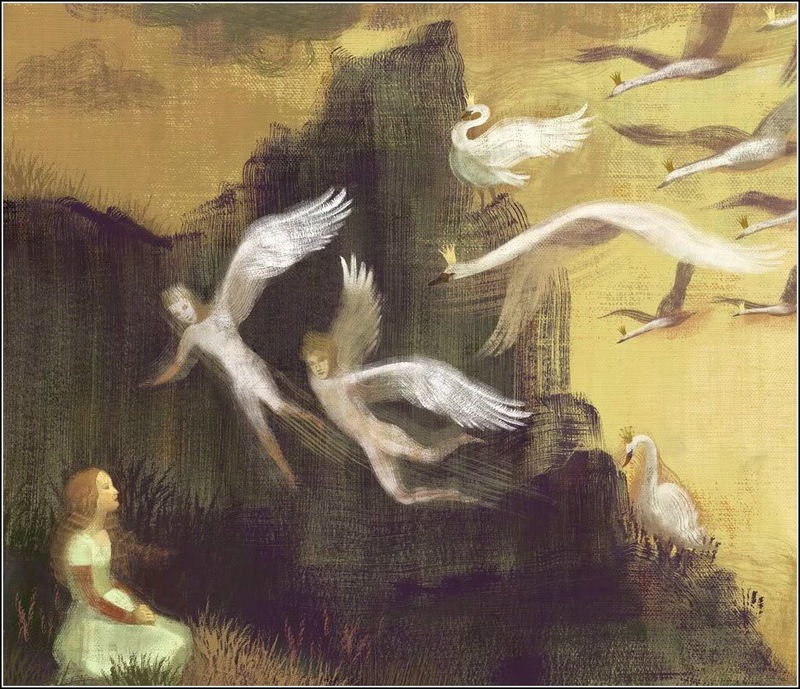 One day his mother, who was a witch and wanted to punish him, turned the girl into a duck, so she was able to fly out of the room and escape-but the girl remained a duck for the rest of her life. In the Lithuanian story Greenbeard, a woman will only marry a husband who has a green beard. The murderer dyes his beard green for her. 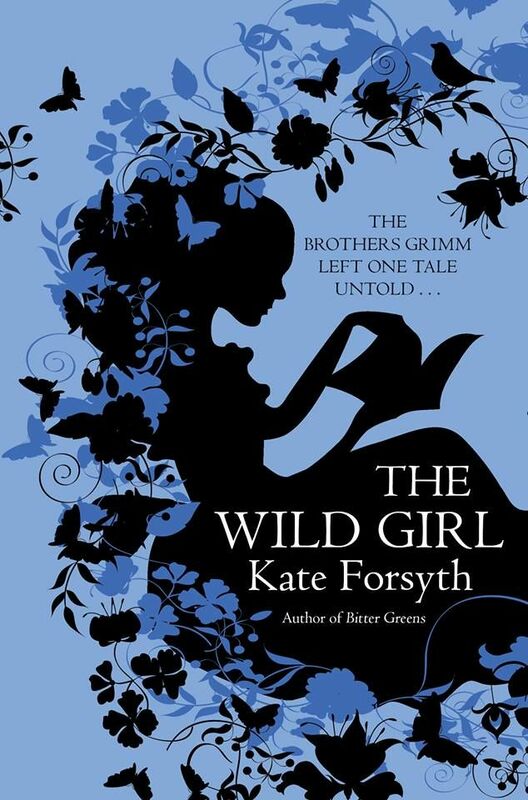 The moral of this story seems to be for women not to be so picky about the men they marry, for after the crimes are witnessed and exposed in a similar manner, it's added that the girl no longer has such in interest in green beards (and of course the image also links the tale to "Bluebeard"). It strikes me that in this tale, as well as others, the cannibals are not referred to as "murderers" or "cannibals," but simply "robbers." Why is their evil downplayed by that choice of words? The same question applies to the Grimm tale-why is it "Robber Bridegroom" and not "Murderous Bridegroom" or "Cannibalistic Bridegroom"? 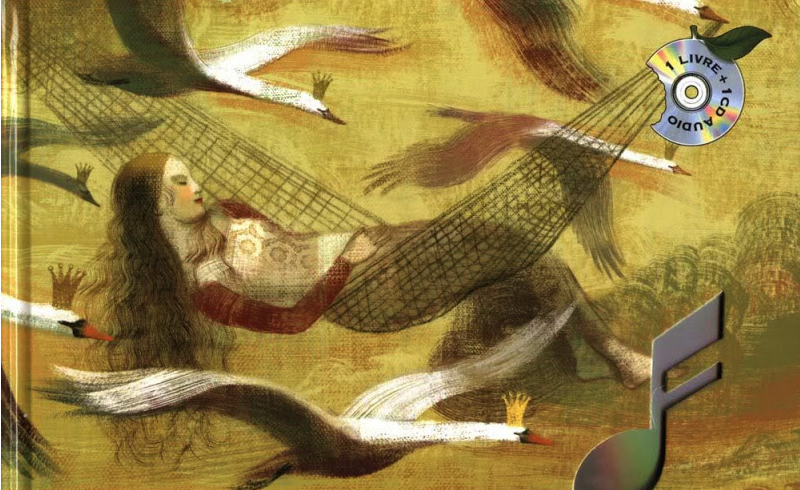 At first I thought "Little Mermaid" was an ironic choice for a fashion book, since usually a mermaid's distinctive look involves no clothes other than possibly modesty seashells. 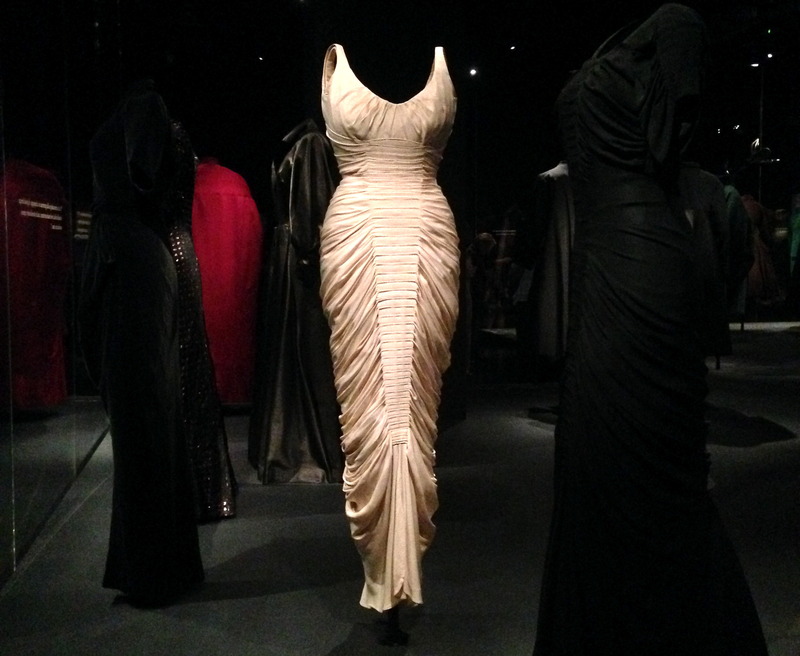 But not only has the mermaid been an inspiration for formal wear for almost a century, Colleen Hill also has some interesting insights into the tale itself. 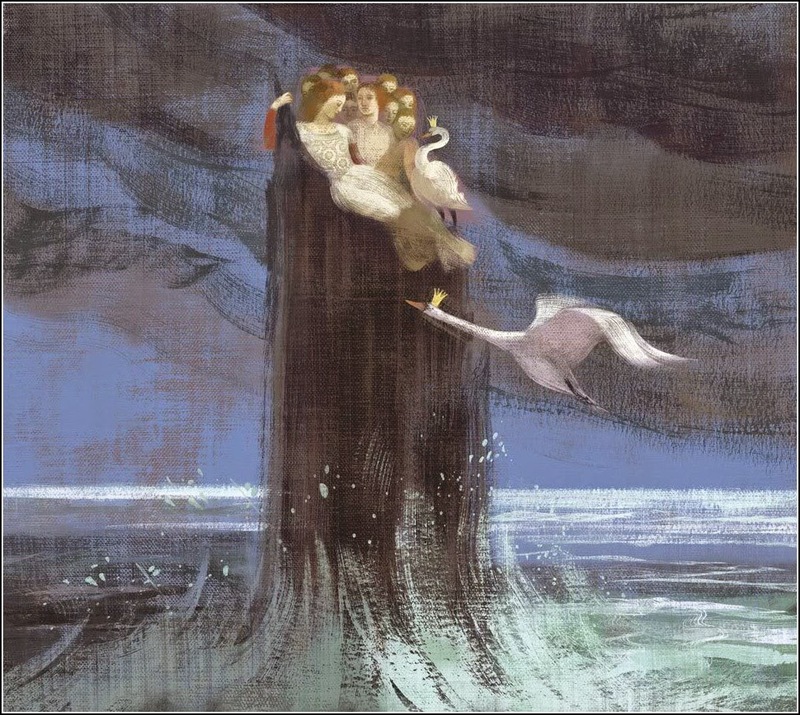 Andersen's tale is somewhat tragic, as it depicts a young mermaid who gives up her home and family, loses her tongue, and must endure pain every time she walks on her new legs, all for a Prince who never even returns her love. Although it's almost better for it to end the way it does-if the Mermaid got the Prince, the message would read more along the lines of "girls, you must give up all of your own hopes and dreams for the sake of a guy, and it will all be worth it" (of course, as Hill points out, the mermaid is also motivated to get an eternal soul and not just a Prince, so in that aspect it's actually a happy story. This fact often gets overlooked when people analyze the tale). 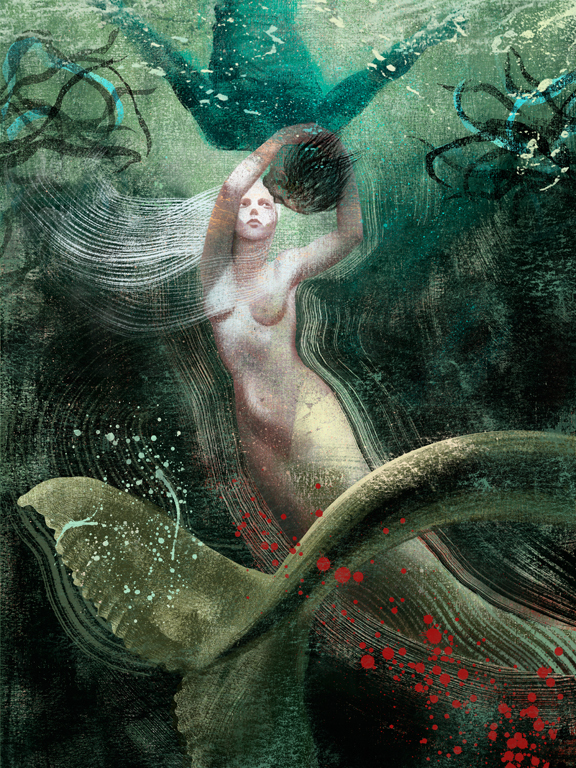 But Hill points out a detail that I, at least, had completely forgotten-even when a mermaid, the heroine must endure physical pain. 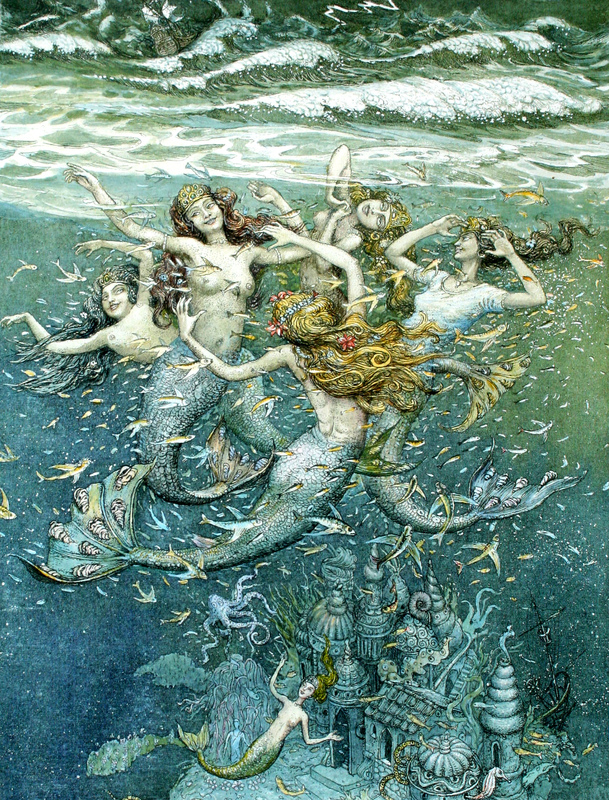 Her grandmother fixes eight oysters onto the princess' tail, and the Little Mermaid protests because they hurt, but her grandmother insists that she wear them to show her high rank. This really changes the meaning of the story-it's not about choosing to endure pain, but which pain. I think this can be read on a couple levels. It could represent, more generally, the pain of growing up, and the fact that any relationship or new stage in life is going to require some sacrifice. It could also be Andersen's critique of expectations for beauty. This may have been more true in an age of corsets, but even now formal events often require less than comfortable heels (although this doesn't just apply to women-I always feel sorry for men stuck in suits and jackets in the summer, and I'm sure their dress shoes aren't the most comfortable thing either). 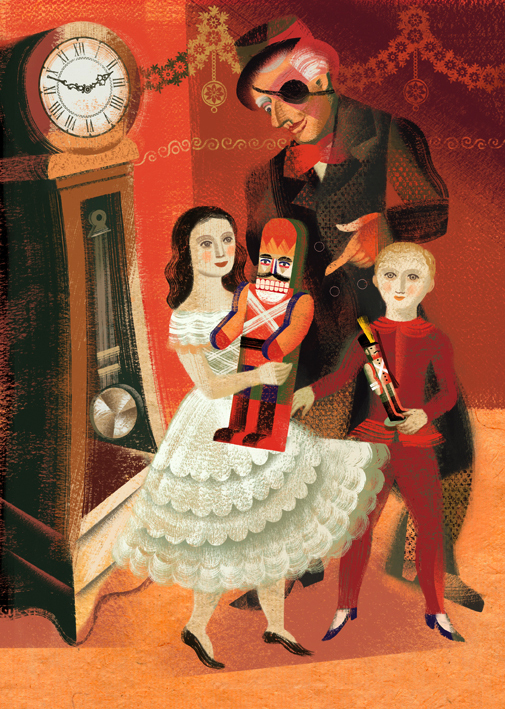 What do you think Andersen is saying through this story? 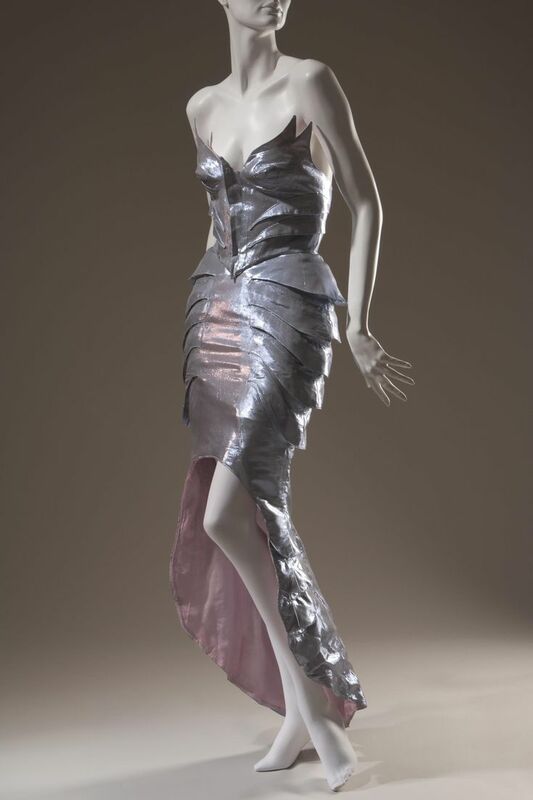 Thierry Mugler, 1988, "The Little Mermaid"
The website even encourages visitors to learn more about the fairy tales in the park-there's a page where you can read the stories of all the fairy tales in the forest or read about the most famous fairy tale authors! Also-I'm out of town for a bit! I've scheduled a couple posts to go out but I won't be able to respond to comments or read your fabulous blogs until I return! "As a child, Prince Leopold Villeneuve unleashed his aristocratic cruelty on an old woman by the bank of the River Chaud. 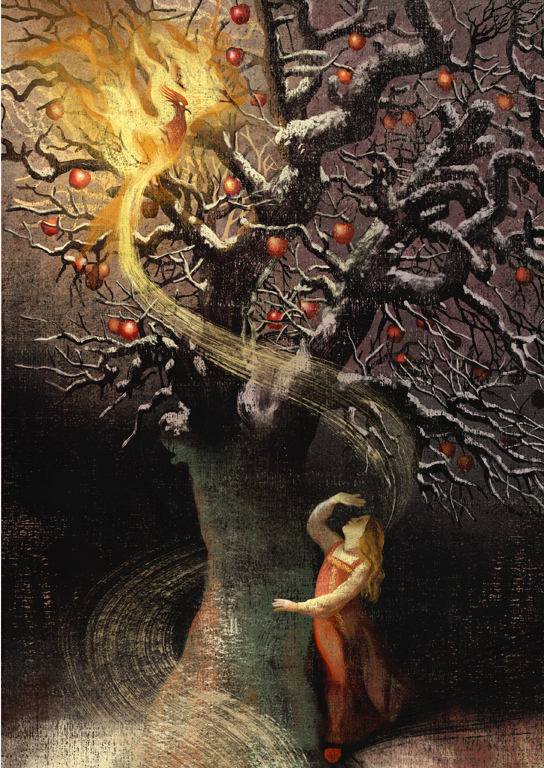 On his eighteenth birthday, the old crone returns to find the same ignorant boy in the body of a beautiful young man. In a night shrouded in mystery, his parents King Alaric and Queen Adele died and Leopold himself disappeared. For years, villagers are frozen in fear of a mysterious and terrifying creature that haunts the town at night. 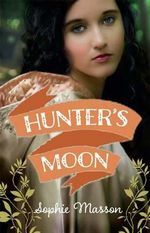 Armand Babineaux, once the wealthiest merchant in the village of Fontainbleu, must secure his daughter Jolie to the unpleasant but enormously wealthy Quentin Garamonde, or condemn her to a life of servitude and poverty. His eldest daughter, Mireille, has already married well, but Jolie will be left all alone in the world if he does nothing to safeguard her future. 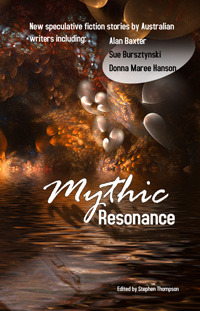 Once the task is done, he must travel to Port Lucerne to recover his last ship or face the same fate in his old age. On his return trip, he is caught in a winter storm and finds himself far from the beaten path, at the foot of Villeneuve Castle. 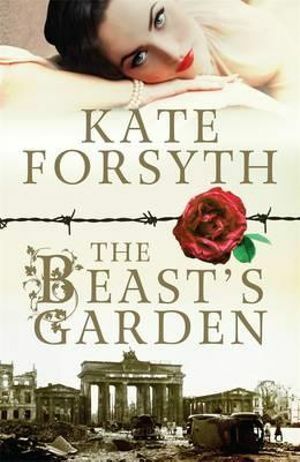 Armand seeks shelter in the castle, and once inside, he is forced to confront the reality of what happened to the royal family so many years ago. The next morning, when he picks a beautiful rose for Jolie, he is brought face to face with the creature of local legend and must make a decision that will change all of their lives forever." I love the nod to Villeneuve's version just in the naming of the royal family! 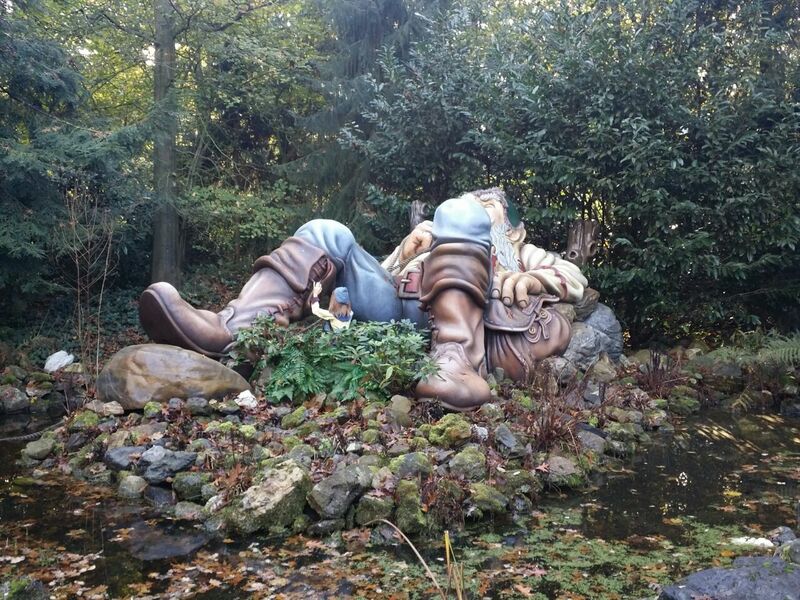 The curse scene seems to be clearly influenced by Disney, but that is a really fascinating aspect of the story to explore more, and this seems to fill some of the holes the Disney version left (where are the Prince's parents? Why is a mere child punished, since it's years before his 21st birthday, in Disney's initial release? And what happened to their royal subjects, why don't they seem to notice their Prince is missing?) It seems this author has done her research (for example, the presence of another sister). I'm definitely going to keep my eye out for this one! Have any of you read it yet? 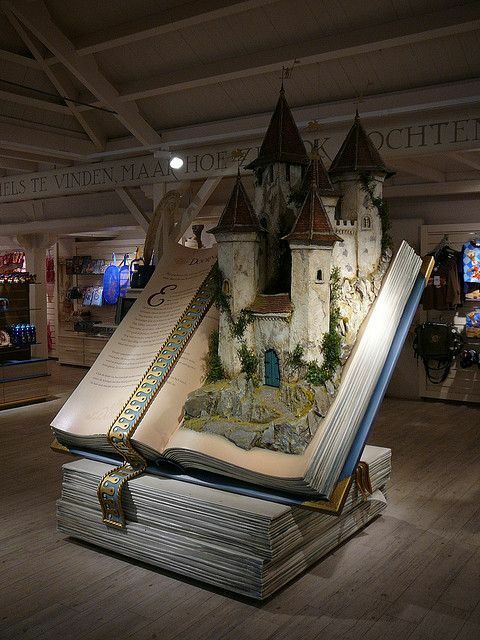 Thanks for those of you who suggested your favorite fairy tale books! (If you didn't get a chance to, add yours to the comments!) 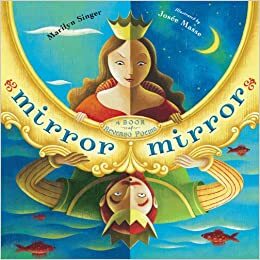 I'm excited to have your most recommended fairy tale readings and hope it's helpful for you as well! 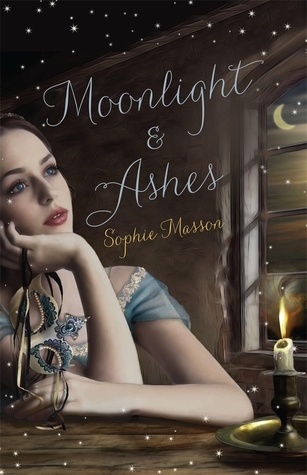 Sophie Masson's YA novels, Moonlight And Ashes (Cinderella) and Hunter's Moon (Snow White, set in the nineteenth century, in a fictional country, and the "Kingdom" is a department store chain with its own fashion label, the Mirror is a newspaper which writes articles saying that the stepdaughter is the new "Fairest") . Also, anything published by Christmas Press, an Australian small press run by Sophie Masson and some artist friends. 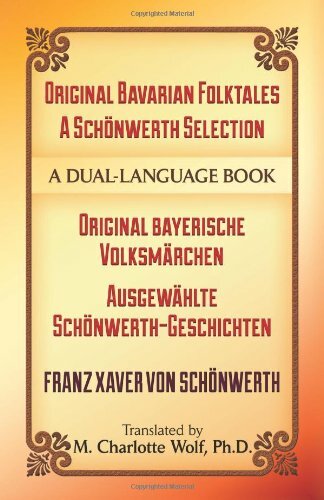 They publish picture storybooks for children, each with two folktales or myths from a different country, retold by a well known children's writer, and beautifully illustrated. Actually, mouth-wateringly illustrated! They're available on line. 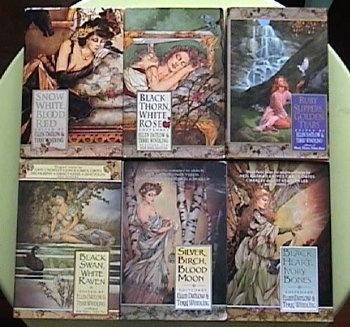 I love The Lunar Chronicles (Cinder, Scarlet, Cress, Winter) which is a series that does a sci-fi take on four different fairy tales (Cinderella, Little Red Riding Hood, Rapunzel, Snow White) as an interconnected story. 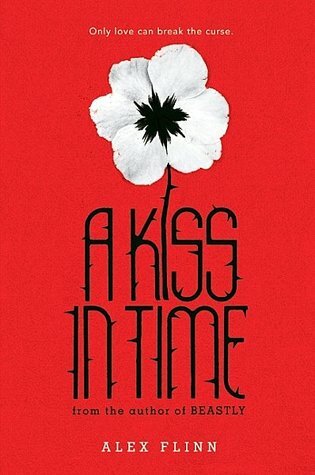 I also love A Kiss in Time by Alex Flinn which is "Sleeping Beauty" recast as a teen rom-com in which the princess is awakened three hundred years later by an American teenager who ditched his tour group. I also like An Earthly Knight by Janet McNaughton which is a teen fantasy retelling of "The Ballad of Tam Lin". 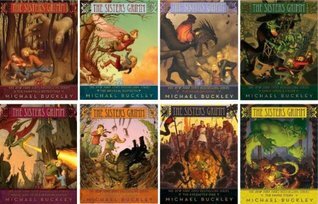 I also really like a kids' book series (which I have still yet to finish reading) called The Sisters Grimm by Michael Buckley, which is a modern-day fairy tale mash-up in the same mold as Once Upon a Time or Fables but which I just think has a lot more fun with the premise. 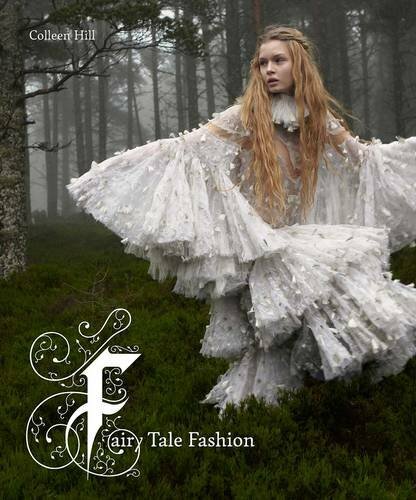 As for me (Kristin), I feel like I can't neglect to mention my all time favorite fairy tale book, Robin McKinley's Beauty, although I feel like I mention it all the time! Other readers, what else would you highly recommend?